American first lady Melania Trump wore a piece of clothing that read "I really don't care, do u?" on her way to visit migrant children at a holding center in Texas. Some of the young people were children taken from their parents at the U.S. border with Mexico. The green, military-style jacket is from the clothing seller Zara. The words were written in large white letters on the back. Melania Trump's spokeswoman, Stephanie Grisham, was asked to about the message on the clothing. She answered, It's a jacket. There was no hidden message. After today's important visit to Texas, I hope the media isn't going to choose to focus on her wardrobe. However, a tweet from President Trump suggested there was a message. He wrote: "I REALLY DON'T CARE, DO U?" 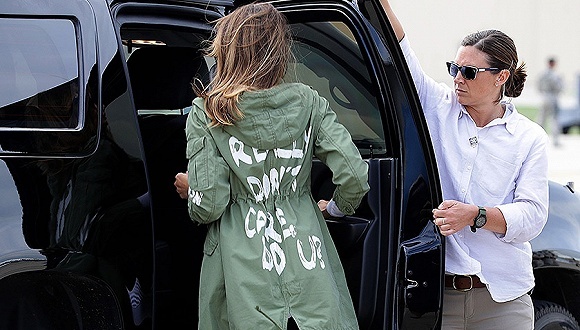 written on the back of Melania's jacket, refers to the Fake News Media. Melania has learned how dishonest they are, and she truly no longer cares! Trump changed into a different jacket before her plane landed in McAllen, Texas. She visited the Upbring New Hope Children's Center there. It is holding 55 of the thousands of children under U.S. government supervision. The first lady's jacket quickly made her a trending topic on Twitter. Twitter user RiotGrl posted: If Michelle Obama had worn the jacket Melania Trump wore today, there would be civil war right now. Media personality Toure wondered in a Tweet whether Melania Trump or those around her gave much thought to the message on the jacket. He posted: I'm confused about Melania's jacket. I don't believe she really meant to say she doesn't care. I don't buy that she's that callous. But I don't believe that neither she nor her staff realized the message she was sending. They all can't be that clueless. So, I'm confused. Zara is a Spanish-based company with a large presence in the United States and around the world. It had no comment on the story. The jacket belongs to the company's spring-summer 2016 season. It is not the first time Melania Trump's fashion choices have been criticized. Last August, the media and public discussed the high-heeled shoes she wore to fly to Texas to view Hurricane Harvey destruction. She had changed into white sneakers by the time she and the president landed. I met Mary on my way to school. I’m sure Daddy didn’t mean to hurt her and he would have died if the bullet had accidentally hit either of us. My blanket can change into different things. How I wish I could go there right now. 5.After today's important visit to Texas, I hope the media isn't going to choose to focus on her wardrobe. Our meeting focuses on the question of women's right. 6.Melania has learned how dishonest they are, and she truly no longer cares! The order was no longer effective.